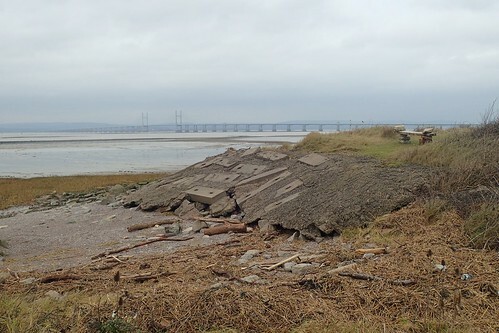 By the time you read this, I should be out walking another stretch of the Severn Way. This walk was an ‘easily accessible’ portion of the 210-mile long trail that I decided that I could tackle on a day where I wasn’t feeling great. 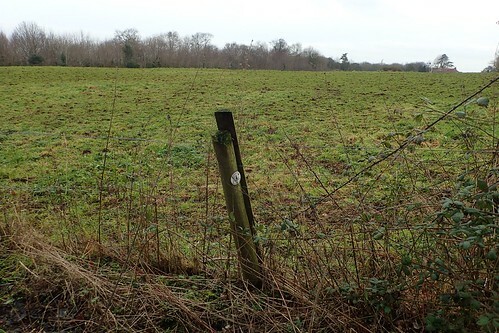 Less than a thirty-minute drive from home and walking through areas I would recognise, if not the Way itself. 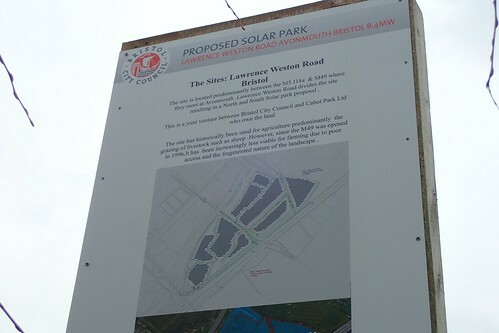 Inevitably, I was going to have to pass through Avonmouth. 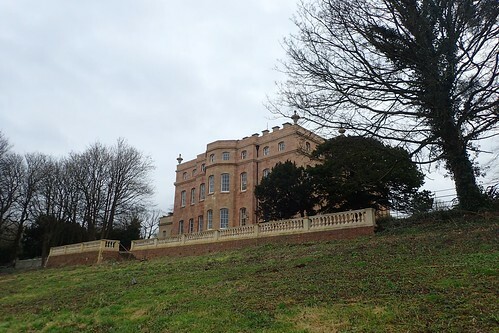 I parked at the Blaise Castle Estate, pretty much on time and knowing that there would be plenty of free spaces to choose from on a Saturday morning. 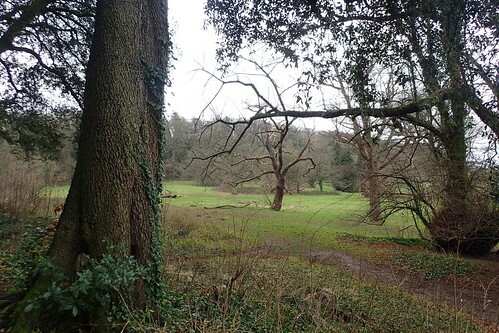 From here, I could cross the estate to connect with the Community Forest Path beyond Echo Gate. I wouldn’t be following the Severn Way from the off but I wouldn’t be far from it, either. It was the option to bag a previously unfound trig pillar that saw me trekking off in the ‘wrong’ direction. 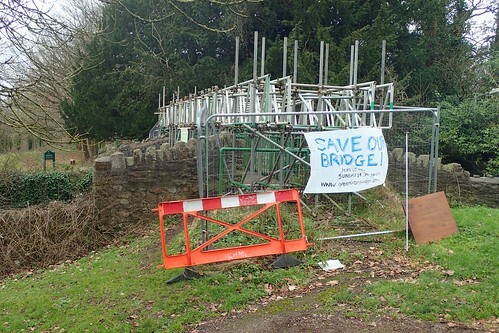 If you research in to the Save The Green Iron Bridge campaign, you’ll realise that it’s been like this for well over two years! One day after my walk, there was a huge turnout in protest at a lack of action from the city council. 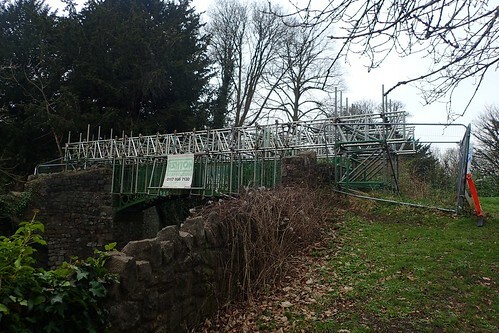 When you think of the costs involved to keep scaffolding in place over such a long period of time, you have to wonder; could the same money (and the rest that’s likely to be consumed) be spent more productively? 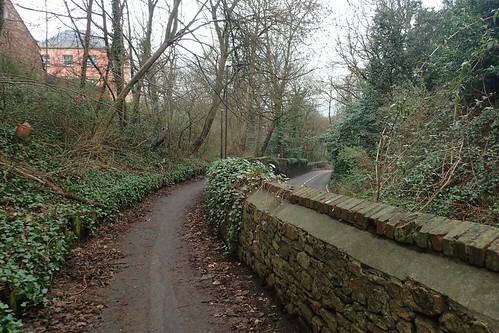 I stooped down to the busy road on a blind bend and crossed with great care, in order to continue my now-deviated walk. 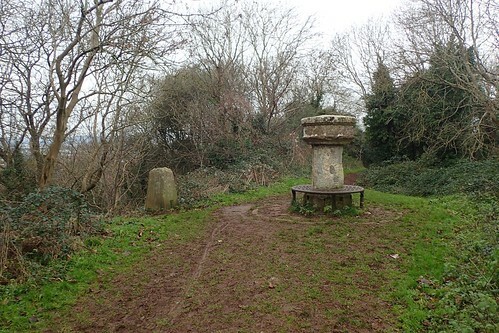 Soon enough, I would meet a Severn Way marker on the edge of Shirehampton, just past the driveway entrance to Kingsweston House. I would now follow this Way towards the west; still heading in the ‘wrong’ direction and soon to pass beneath the property. 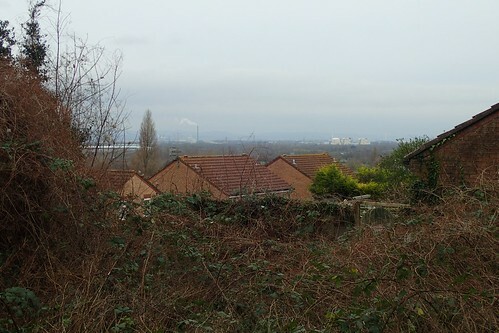 Close to the woods and with dog walkers emerging from every turn, I lost sight of the Severn Way. Which was easily done, thanks to an apparent lack of waymarking. I continued in what I thought was the right direction, only to find I was leaving the park. So, I stopped for my first break a the available picnic tables, only to spot a car park away to my left and, from there, I could determine where I was and needed to be. Still walking without a waymark, I marched on through the woods. Groups of volunteers were clearing branches and vegetation. 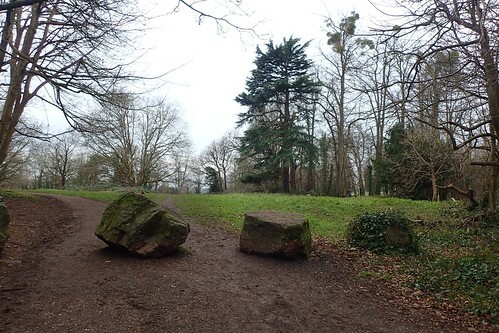 I wasn’t sure if they’d blown over in the wind or if this was an act of maintaining the land. 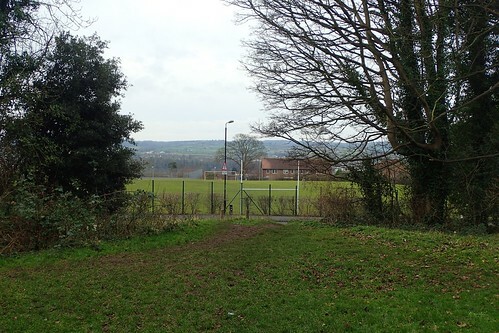 I recognised the school field, having walked through here before. 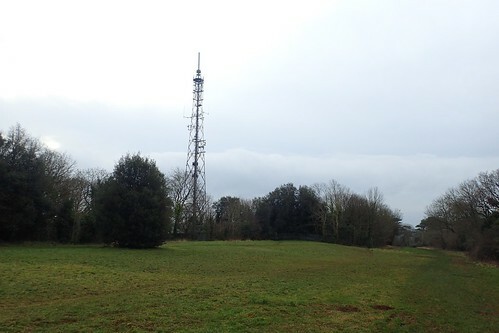 There was the trig. Along with some other pedestal-like structure watching over it. Only 67m above sea level. 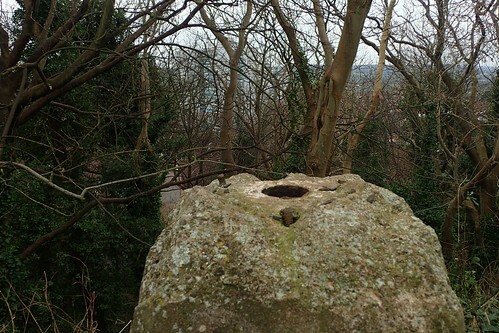 This is trig has sadly suffered some damaged to the top, possibly from erosion. It’s also missing many of its original features. It’s one saving grace is that it cannot see the sky-blue tower block of flats that wouldn’t have been there, eight decades ago. If anyone can tell me what this is or was, I’d love to know. It’s not a bird bath(!) and I do think it resembles a toposcope or topograph. But it lacks the contours and detailing on top. 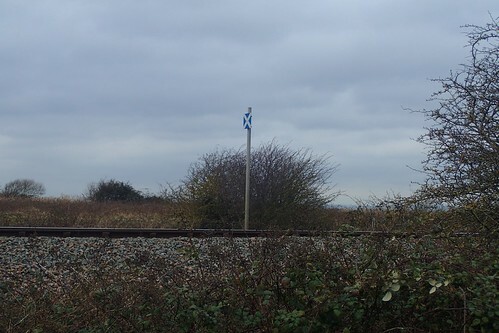 Retracing my steps now towards the house, so that I could begin my inevitable journey towards Avonmouth; I realised there was a waymark post after all… It just wasn’t very conveniently positioned! Wind turbines, nuclear power stations, huge warehouses and industrial traffic… This is what coastal walking is all about, right? 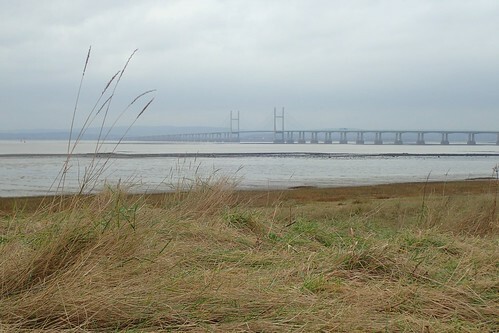 Following the Severn Way towards Lawrence Weston began well. Every hundred metres or so, I’d see an indication that I was on the right path. In these woods, they were so frequent that I could not possibly go wrong. Then, I arrived at a fence with no means to pass beyond. I’m still puzzled by this. To my right, the “path” (which may well have been private) led to the road via a large metal gate. 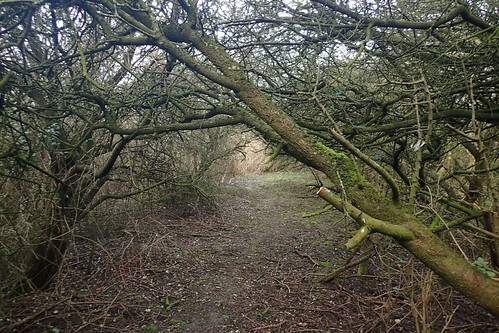 But the way was mostly overgrown. Looking left along this fence, well, it looked as though there had never been a path! I think this was at ST 545 779, as I could see a building towards the road on my right. But I’m only about eighty-percent certain. 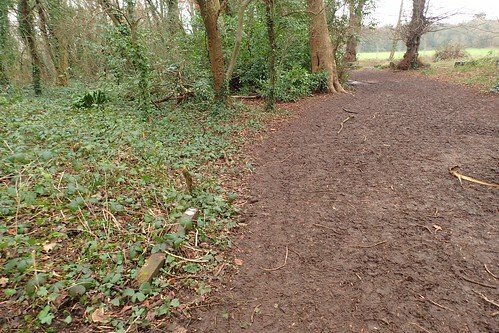 Even on the OS map, the right of way looks unclear. 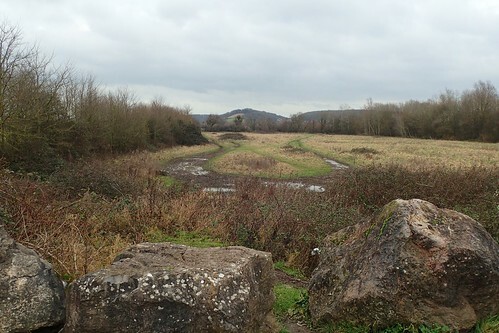 Anyway, I backtracked through the woods and took a chance on a narrow, unmarked path following the backs of houses… It could well have been an act of trespass along following an animal track but it got me to the point at which the Severn Way meets the next road. It was on to the streets and pavement of Lawrence Weston. I took a wrong turn, although heading in the right direction, I quickly realised this error. 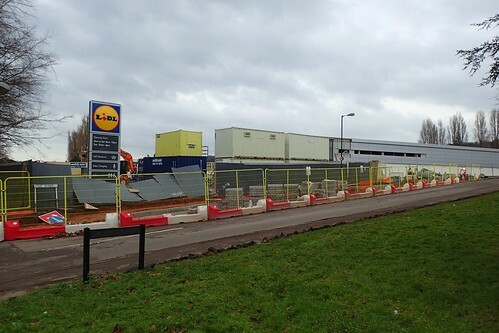 I wasn’t displeased to discover another Lidl store on the way (even though, I’ve become a greater fan of Aldi, in the last year). 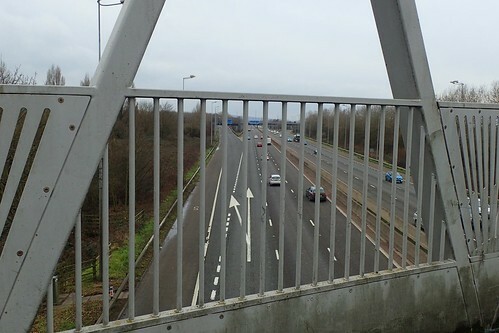 From the end of a dead-end road, I would cross over the M5 motorway, close to Junction 18A. 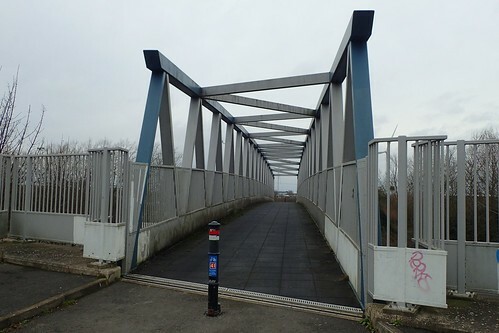 This forms as part of the National Cycle Network. Further south of here, you can actually walk alongside the motorway (as if you’d really want to), where it crosses the River Avon. 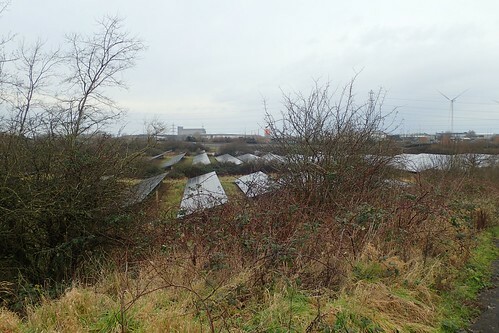 Looking left and with buildings of Royal Portbury Docks in the distance, a solar farm sat in the field beside me. Oddly, this doesn’t currently feature on the latest OS map. 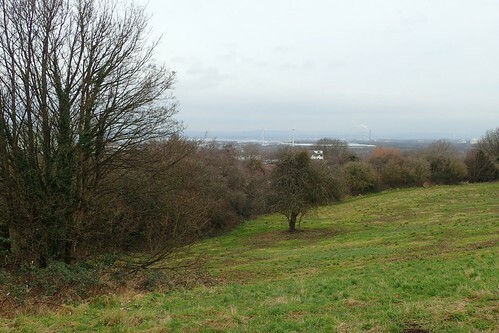 Bristol City Council have proposed to continue the development right across this moorland, which sits between two motorways and is currently not used for the grazing of livestock. I used to be a fan of solar panels and I’d still prefer to see them over another stone-age power station. Since learning that their components have only a finite life and are typically dumped (and not recycled) when the time comes for renewal, I find it’s yet another example of mankind’s poorly thought short-term quick-fix. All at the expense of our once beautiful planet. 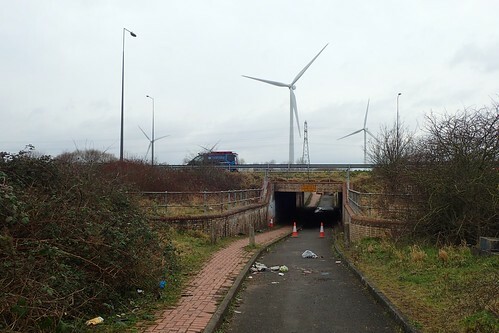 I haven’t finished moaning there, as I was about to pass under the M49, while Avonmouth lay in wait ahead. 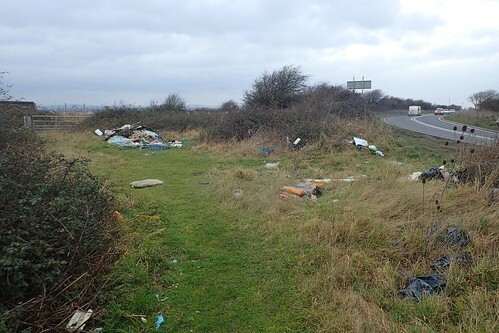 Is this the work of passing motorists, ejecting waste from their seats in excess of 70mph? This area’s quite remote and not easily accessible by any vehicle. But I love how pristine the block paving is and how someone once had the bridge idea to deck the walls in ceramic tiles! Were they deterred by the sight of orange cones? Or, did they illegally add to the waste while I wasn’t looking? Marching on in a bit of a sickened mood, I can at least now say that I’ve seen the local Amazon warehouse. On the OS map, a right of way appears to run straight through the building! 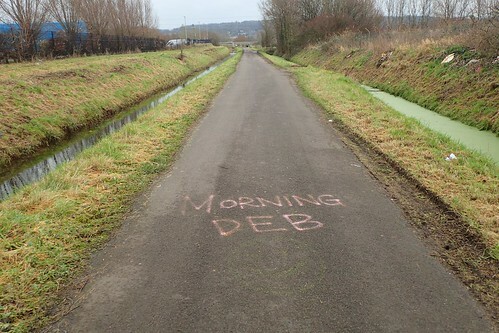 Whoever Deb is, I hope she immediately filed a restraining order against the vandal who created this. 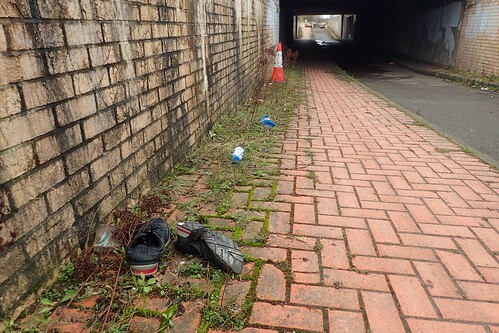 At the next bend in the path, I encountered this mess; discarded as if someone would later come along and clear it up. 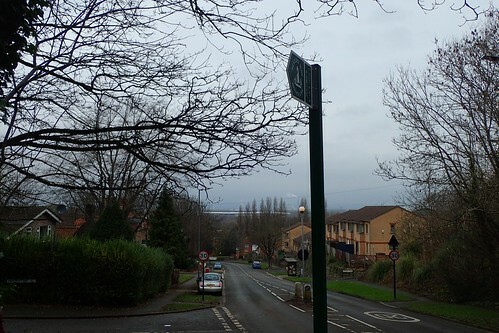 There are security cameras outside some of the warehouses along this road. If someone wanted to, they could probably identify the culprit’s vehicle. 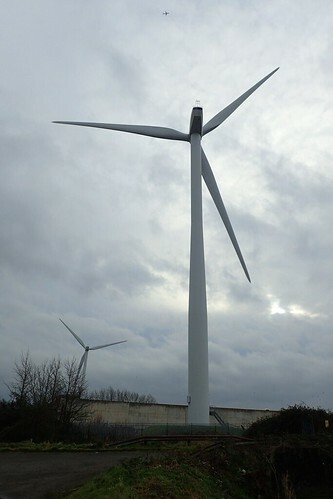 I was only 50m away from these wind turbines (again, they also have ‘disposable’ parts) at certain points. I didn’t find them noisy or disturbing at all. But neither could I hear the aeroplane you can just see above it. 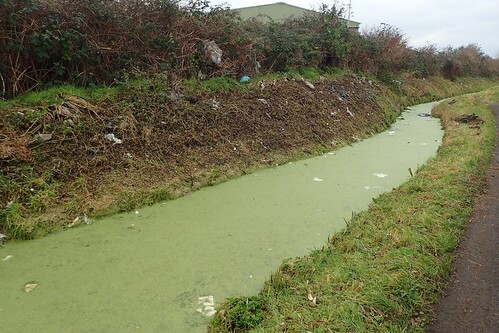 I believe there’s a landfill site across this rhyne, which I think may account for much of the litter you see in the photo above. This, I’m willing to believe, is ‘accidental’. Perhaps someone’s emptying a skip, the wind swoops in and carries a quantity away. 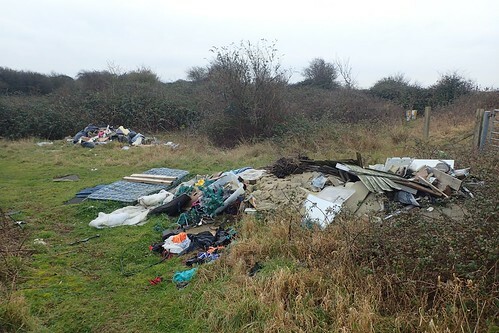 I’m not saying it’s acceptable and I know that a quantity of ‘general waste’ still gets sorted. 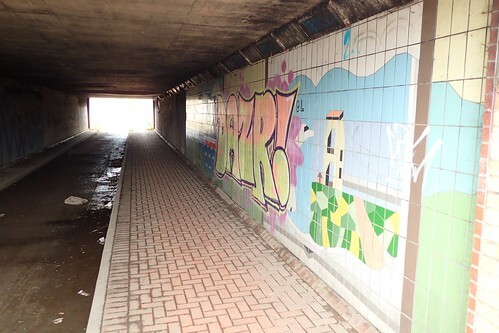 But the scattered pattern here, suggests to me that it was less intentional than some other examples from this walk. On the right appeared to be a Police depot of some sort. Many patterned vehicles in the car park, along with a staggering quantity of bikes. I’d like to think these belonged to employees of this site but I reckon they’re stacked here for another purpose. 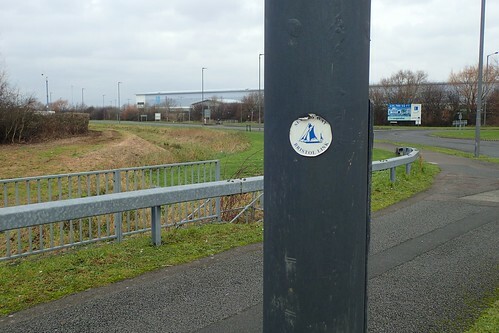 Across the roundabout and another waymark sticker led me on towards the Co-Operative’s warehouse. 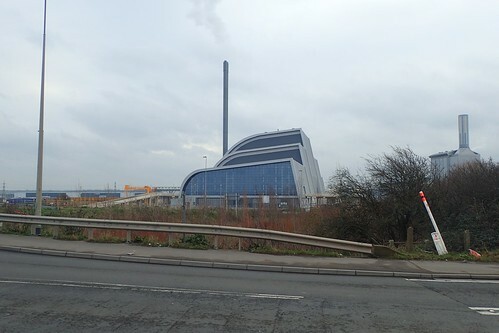 Until seven-years ago, I worked in the Co-Op’s former chilled warehouse over at Portbury Docks. This new facility (by my estimate, it’s nearly three-times the size) was opened later that year, although not on time, as I recall. The car park here was phenomenally big. 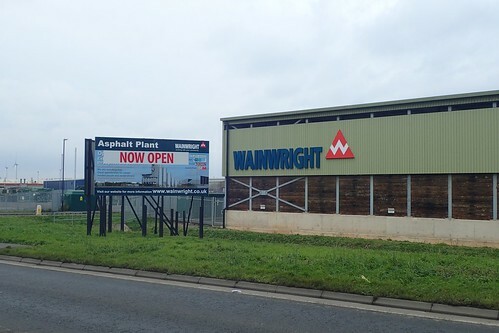 Their former warehouse was run by Wincanton – employment, logistics, everything. While the Co-Op now run this one directly. 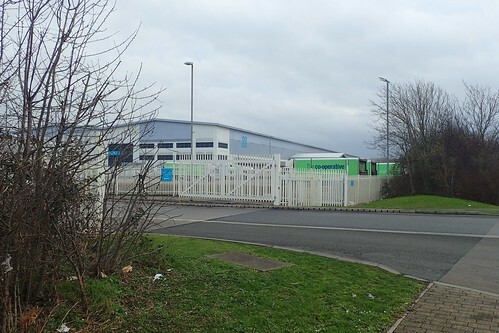 Prior to its opening, another warehouse down in Bridgwater was closed, with the loss of many jobs. I often think about the people I barely knew for six-months and wonder, how many of them were able to retain a position within this new unit. At the next roundabout, I would turn right on to the A403. I doubt Alfred would’ve ever walked this way. Aside from the flytipping, this hadn’t been quite the suffocating experience I’d considered. Maybe it would have been different on a weekday. 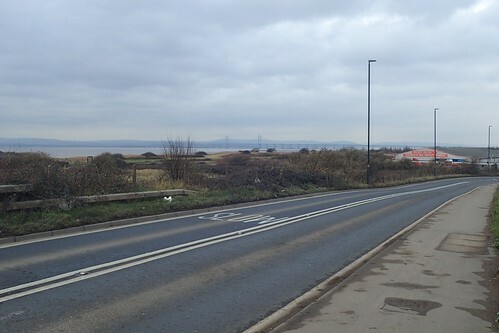 With the Second Severn Crossing in sight, my spirits began to lift. 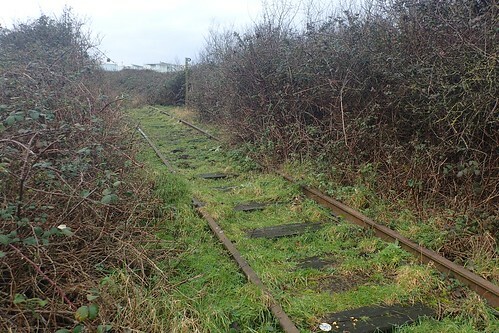 Turning off the main road at its bend, I continued to cross a disused railway line, which was probably used as a short-distance line running goods to and from the docks. 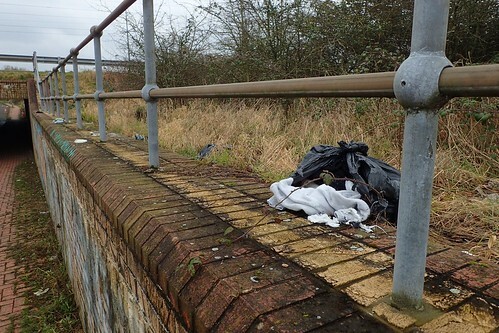 While the wooden sleepers are rotting away, I imagine there’s some scrap value in the steel runners. With cordless angle grinders available these days, I’m surprised no-one’s already turned up to help themselves, after dumping their other load. 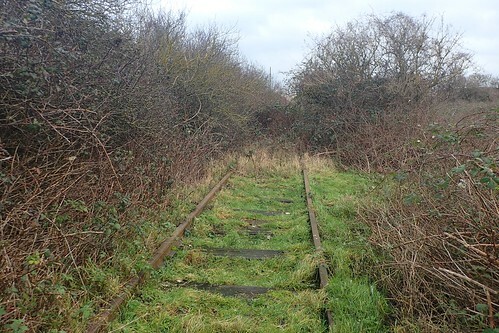 Walking parallel to the existing railway line, which runs as far north as Severn Beach, from Bristol; I followed a wooded walkway, not unlike those experienced on some of my coastal walking. 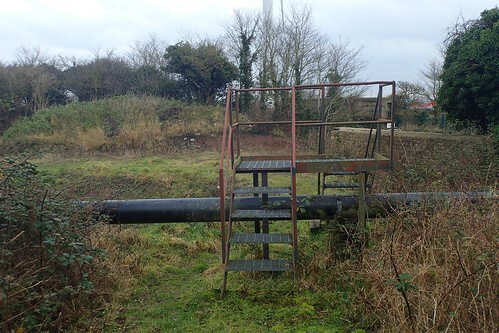 A rather convenient set of steps helps you over this pipe, heading out to sea the estuary… I hope it’s only carrying water. I certainly wouldn’t want it to burst while clambering over! 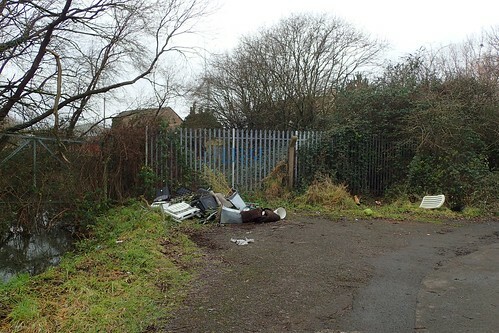 At the next bend in the road, I discovered perhaps the worst example of flytipping for this day. How do people get away with this?! 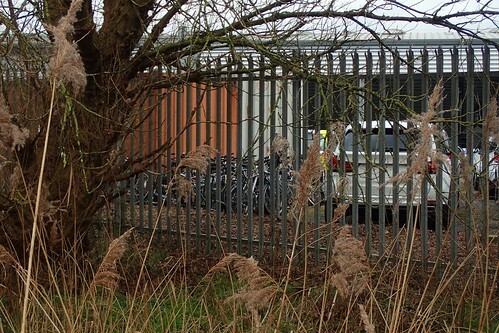 This is right on the bend of an A-road, next to an industrial area that operates 24-7… Add to that, the fact that materials like wood are quite easily recyclable. I regret not filming this walk or poking around for personal details. I’ll have to head back, soon. 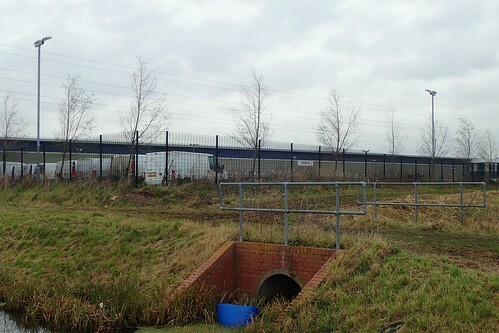 Just across the road from here is Seabank Power Station. Now, I didn’t know much about this at the time of passing but, I’ve just read that it’s a gas-fired plant. That doesn’t mean a lot to me but instantly, I believe it’s much less-hazardous than nuclear power. Cheaper to build and it can provide 1.6 million people with electricity. I guess the only issue would be tapping in to the gas line. 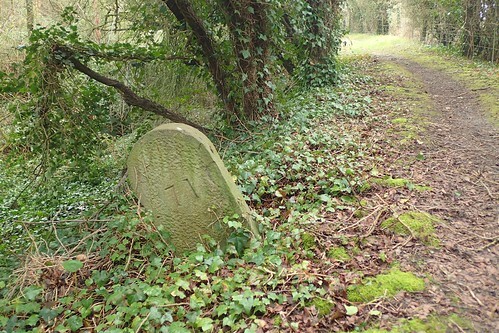 On from that and veering away from the road once more, I noticed this stone, which may well be an historic boundary marker of some sort. I wonder what the ’71’ refers to? 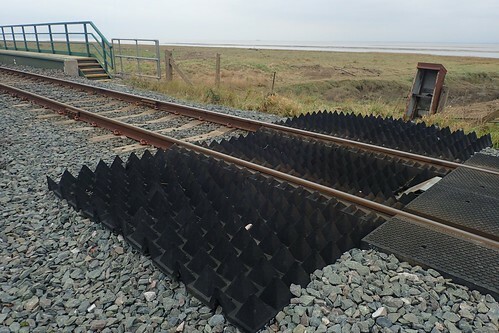 I’d end up crossing the main railway line, where black spikes presumably immobilise any four-wheeled vehicles determined to squeeze through the kissing gate. A lot of work would’ve gone in to installing these pipes. I wonder what comes out the other end? Lunchtime was near, although I chose not to sit on the bench overlooking the estuary, that someone else had left behind. 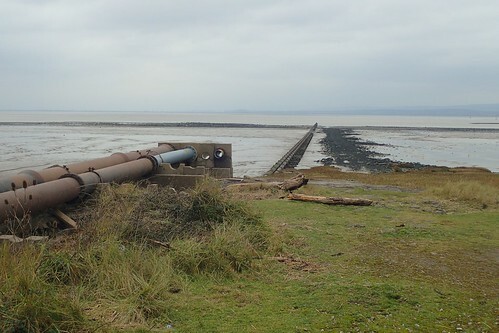 Along here, I took a non-designated path running closer to the water mud, before reconnecting with the Severn Way ahead of Severn Beach. A bit further on, I would stop for lunch. A grey day overall and with a slight breeze. One that had so far remained dry. 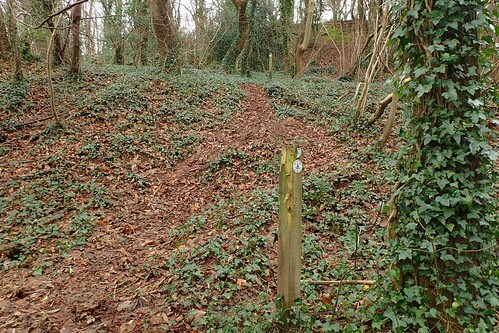 In my next post, I share my return journey to my car, where I follow another portion of the Communinty Forest Path. 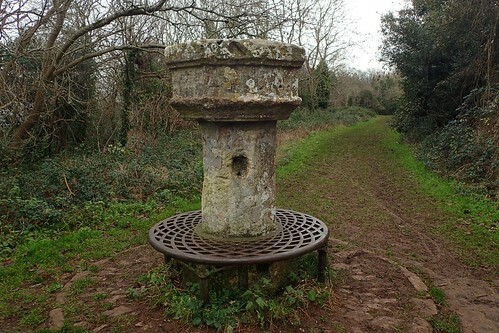 This entry was posted in Severn Way and tagged Avonmouth, Blaise Castle Estate, Bristol, Community Forest Path, flytipping, hiking, Kingsweston House, Lawrence Weston, outdoors, save the green iron bridge, Severn Beach, Severn Way, South Gloucestershire, trig pillar, trig point, UK, Walking on 11/02/2018 by Olly Parry-Jones. I hate when waymarkers vanish on a walk, or a random fence appears. You did well to find a route through.